Maternity Portraits as Unique and Fun as You! Jennifer’s Maternity Photos, Silly and Fun, Just Like Her! Many of you know Jennifer, she has worked with me for 15 wonderful years. I’ve photographed her family countless times, her daughter Serenity has grown up in front of my camera… my little studio star! So when she announced that she actually wanted to do a maternity photo session to celebrate their newest addition I couldn’t wait to hear her ideas. Jennifer is fairly unconventional and has a very whimsical personality so I knew she’d want to do something a little different. I love it when anyone comes to me with unconventional ideas or says I’m looking for something different and asks me for ideas. It gives me the opportunity to think outside the typical Houston photography studio box. For Jennifer, she made it clear that she felt anything but “glowing” this pregnancy but knew she wanted to document this time with the family dynamics changing. She wasn’t comfortable showing skin, her feet were very swollen so she preferred being barefoot, and most important she needed it to feel light hearted and wanted a lot of laughter. 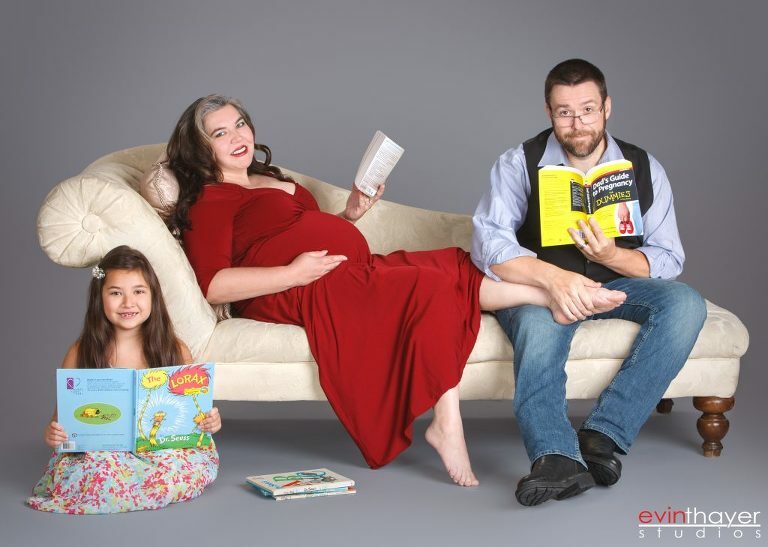 So we took the not so fun side effects that this pregnancy had thrown at her on stride, and came up with a wonderful photo of her family reading children and pregnancy books while her husband rubbed her swollen pregnancy feet. For the next look, knowing how much Jennifer and her family also love to dress up for Halloween and comic book conventions, we felt we had to incorporate that fun element! We came up with a Marvel Comics fan vs DC Comics fan photo, if you are into comic books you understand this rivalry can be strong amongst comic book nerds. Thankfully the parents have agreed to embrace both and let the kiddo be whoever he wants to be. Judging by how much fun this family has together I’m sure the newest addition will be awesome! So congratulations Jennifer and family, we can’t wait for your family portraits at your newborn photo session and all the wonderful years to come! Ps. Do you have friends or family expecting? Don’t let them miss out on capturing their newborn during those first few weeks, give them a gift certificate to our Houston photography studio and they will have photos to cherish for a lifetime. Call 713-524-0199 for your personalized gift certificate.